I love my Synology NAS, and I love Plex. I also love my Xbox One. Finally, today these three things are working together to give me a lovely unified view of my media library. I have a Synology 1511 (the Synology 1513 is today's model). It's a 5 bay Intel-based NAS. I put four 2TB 7200 Seagate drives in it. In the few years since I've had the Synology I've had 2 drives fail and in each case the Synology emailed me, I pulled the drive and replaced them (I now keep two spares around) and rebuilt without incident. 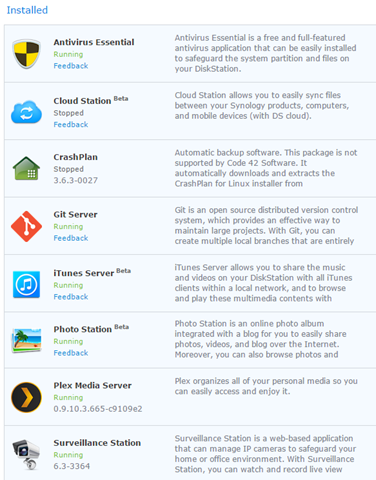 I run Plex on this Synology as it also hosts all my family photos, family videos, and DVD backups. The Synology (since I upgraded the RAM cheaply) also runs Surveillance Station monitoring 4 IP cameras posted around my house, as well as VPN Server, *and* CrashPlan cloud backup. I used to run most of this stuff on my desktop, but I'm convinced more and more that every connected home needs a Home Server. I've even added a Git Server, iTunes Server, and a "Cloud Station" which is basically "Personal DropBox." Glorious. 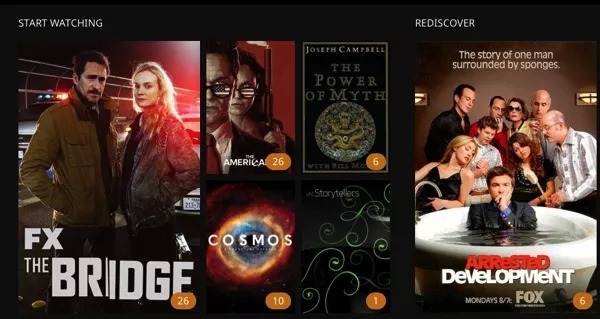 I use Plex extensively on my iPad and Surface Pro 3. One of the best features (there's a million) is being able to seamlessly mark a file as "offline" and sync it to a portable device. Makes airplane travel a lot nicer. The one missing part has always been watching Plex on my big screen. While I do have a Chromecast and we enjoy it, the Xbox One is our set-top box. We changed an option on the Xbox under Settings so it "Boots to TV." The Xbox controls our DirectTV and my wife uses a Logitech Harmony One Remote that we still love. From the Xbox we can "Xbox Watch Netflix" or "Xbox Watch HBO" and it just does the right thing. But switching inputs to the Chromecast, getting a tablet out, starting Plex on the tablet and throwing it to the TV requires more tech than my wife is willing to give. Until now. 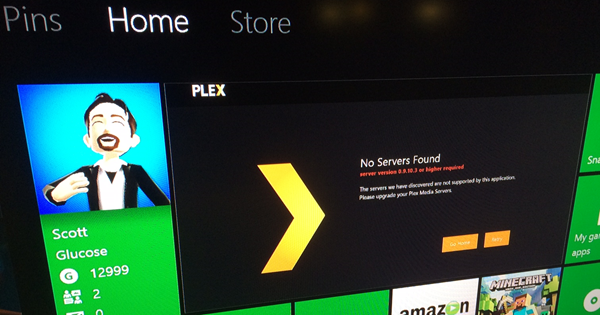 Plex is out on Xbox One (and Xbox 360) and there was much rejoicing. A Plex Pass is required, but it's SO worth it, and not expensive. Plex Server running somewhere - You can run it on any decent NAS, your desktop machine, or any machine you have laying around. A Plex Pass - A monthly or yearly subscription. It's a fantastic value. You CAN use Plex free, but with the Pass you get the offline sync, Xbox support, Movie Trailers, Cloud Storage Sync, and Camera Upload. One note for Synology people like me, you’ll need to install the latest Plex Pass preview release of the server (v0.9.10.3). Not a huge deal, go to Plex Downloads and get the right version for your Nas. I downloaded, then logged into Synology and did a manual install. Now, go to the Xbox One App Store and download it and sign in. If you'd signed in before and got a warning that your Plex Server was the wrong version, you'll want to shut down the Plex app completely or reboot the Xbox to get a proper retry going. The app looks fantastic, supports both Kinect AND Voice and really fits in with the other apps I use like Hulu and Netflix. 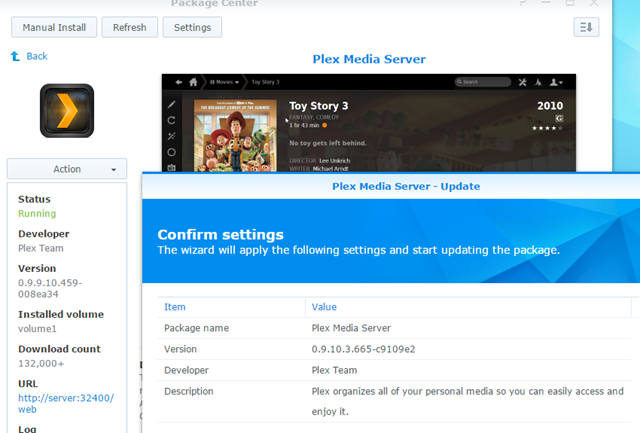 Plex is epic because it's your media EVERYWHERE. Here's a picture of the devices that my family have used to talk to Plex this year. Anyway, enough gushing. I couldn't be more thrilled. If you are already a Plex user, you're gonna love this. I'll do a full video and walkthrough of my setup soon, but Plex on Xbox One has finally turned my Xbox One into the ultimate media server. When the Media Player with DLNA support releases in a few weeks on Xbox One, it'll just be gravy. I don't think it an understatement to say this is life-changing. Praise to the almighty Plex gods! Can PLEX play your stuff without transcoding it? Scott, can you use your juice to get HBO to finally finish the Xbox One app? "Xbox Watch HBO" is still missing. Does Synology's Cloud Station save version history of your files and allow you to easily (via API or SSH?) revert your files to whatever version they was on a given date? I was recently hit by a Cryptowall attack (still don't know if the attack vector was the RDP port or Java) and what saved many of my files was a python script that allows me to revert file versions in Dropbox to their state on a given date (before the attack). I would like to be able to rely on my Synology NAS for Dropbox-like services, but given that the file version history feature of Dropbox just saved me a lot of headache I want to insure that whatever solution I adopt going forward will afford me the same version rollback ability. Is your Synology doing transcoding for the xbox? I wouldn't have thought the NAS had enough grunt for transcoding as I believe it only has an atom processor in it? So thrilled this has been released. Like you I have a chromecast that I used but it will be thrown in the cupboard as having this work seamlessly is great. A little off topic but loving having the backup to Onedrive functionality with the new DSM 5.1 beta also. Works very well. Allows me to auto upload photos from my phone to plex and then have these backed up offsite to my Onedrive. Perfect. The newer 5-bay Synology is $769 on Amazon at time of writing this. The 8 bay version is $230 more. I know I may be trying to future proof a bit too quickly, but if I get the 8 bay one and only do 4-5 drives in it, can I add more to it after? Is it a pain to add drives to a RAID after the fact (backup to other drives, rebuild array)? Alexey - yes if it's a straight MP4. Robert - Yes, lightly a little bit of a hassle. I would need to google. @Robert - You can do that, but you'd need to use SHR or SHR-2 rather than a vanilla RAID setup. Adding drives to "normal" RAID volumes, means backing up all of the data, re-creating the RAID volume and then restoring. I personally have a 4-bay Synology and have recently upgraded from 4x3TB drives to 2x6TB + 2x3TB drives. It took a couple of days, but I didn't have to find somewhere to put all my data. If I start to fill up my Synology with 4 x 6TB drives in it then I'd probably go for an 8-bay. I have a similar setup but no Xbox One (just 360) so I'm looking forward to this. For me, I found that the Synology does try to transcode HD video if you're playing on a device with a resolution lower than the source video. For example, my Samsung Galaxy S3 has 720x1280 resolution so if I try to stream a 1080p video, the Synology tries to transcode it. It's not very good at it and the result is pretty choppy as it pauses, transcodes, buffers. For SD video where it doesn't have to transcode, it's very smooth. The built-in Synology "Video Station" service can transcode HD on the fly without the choppiness because it has a custom version of ffmpeg built in but, of course, Video Station isn't Plex and doesn't have the ubiquity. To address the choppiness of the transcoding I may actually introduce a dedicated Plex Server box that serves content stored on the Synology. I'm not sure what the network latency will do to the delivery, but we'll see. I have the Synology 1513 and am very happy with it so far (have had ~10 months). The web UI is excellent and I've had zero hardware or software problems. I realize that the cool kids have moved on, but I was happy to be able to install Subversion (with pretty much zero effort). I installed Plex a while back, just to see what it offers. After doing so, I have a noob question: where do folks typically get the video content that they host? I'm guessing home videos and bootleg DVDs are common sources (for some people), but neither of those is for me. I do have a big box of physical DVDs (e.g., movies, TV series), and it would be cool to be able to put these on the Synology and play using Plex. Is there an easy way to rip my purchased DVDs for hosting by Plex? @Thomas - Many people use a program called "MakeMKV" very successfully to rip the movies they own. Then you can transcode the resulting MKV file to MP4s using a program like "Handbrake". Handbrake has predefined profiles (and MANY settings) to select the quality you desire. The resulting MP4 files are much smaller and often times require no real-time transcoding by your NAS hosting Plex. Plex is pretty slick, especially if you network with friends who also have Plex servers, which I think is the strongest feature of the ecosystem. According to the Plex site the 360 version is "coming soon." I'm sad. I was hoping to be able to replace my use of Windows Media Server + Xbox 360 with Plex + Xbox 360. Looks like I'll have to wait a little longer to give Plex my money. I'm planning on getting a Synology RS814+ and I going to use it as a Plex server until the home automation company I'm working with recommended Vortexbox (http://www.vortexbox.org/). 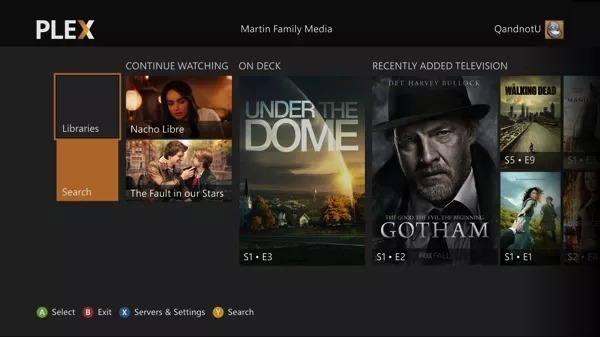 With Vortexbox, it acts as a Plex Server and in order to get content into Plex, you can just insert a CD, DVD or Bluray disc and it is ripped automatically and added to the Plex media library. I'm going to use some parts of an old PC I have laying around and put together an i5 with 4GB RAM to run Vortexbox. Great post! I have been looking at replacing my Windows Media Center / XBox 360 Media Center Extender duo. It works great, but has not been updated and doesn't seem to be going anywhere. We are "cord cutters" and use Media Center as our DVR recording OTA programming. I have two HDHomerun devices that Media Center uses to record the programming. The way I understand it, Plex does not have a "built in" DVR. There are a couple "backends" that are available. Do you have any experience with any of the "backends"? Do any of them work on the Synology? Can you watch shows while they are recorded in Plex? The transcoding thing is the dealbreaker for me. I have an Android media player which plays ANYTHING I throw at it. Puts Plex to shame. I stream the files from my QNAP NAS to the player to the TV. No need to burn calories transforming the original file to a format that Precious Plex can play. Apologies for going negative, but I am a massive Plex-hater. So over-rated. And BTW, who cares about all the artwork and other meta-data? IMDB app on my phone is for that! This sounds awesome but the 1 thing stopping me from jumping in is that Plex doesn't support live TV (I have a HD Homerun & WMC for that) so there would still be a disconnect between where & how I watch live TV and where I watch recorded (formerly live) TV. What do you guys do about that? Or is it not a big deal? If we had a working OTA/FTA One Guide on the Xbox in Australia then that might solve the problem for me, I wouldn't have to know that WMC even existed. Just FYI, if you have your TV linked up to a PC, you can use 'Plex Home Theater' as your client, (https://plex.tv/downloads) it runs in full screen mode, no mouse, and is awesome. I've been using Plex for years and the family loves it. All our dvd's are added to plex and it just works as you describe it. Everybody can figure it out. Even my 70+ mother. Fantastic. We also add family photo and video (via bittorrent sync) to separate sections. That part doesnt work so well as photos and video are split into 2 sections. How do you handle the photo/video stuff? Good to hear the Logitech Harmony One is part of your setup. We were great fans as well but it failed us recently and we moved to the Harmony Touch. It has good features as well but the One still has the edge for us. Scott (or anyone) - could you briefly enumerate the relative pros\cons of using a dedicated NAS versus an old computer lying around and throwing a RAID card into it? It seems to me that a fully-equipped NAS is ridiculously expensive and one could get a reasonable tower capable of doing most if not all of what a NAS could do and do more. Or is it simply power savings? @Jeff, Speaking only for myself, the advantage of a Synology (or Drobo or Readynas) is that you can mix and match drives and replace drives on the fly without tearing down and rebuilding the RAID array. All three manufacturers have some form of hybrid RAID in which you can swap out a drive or add a drive (of potentially different size) without having to back everything up, tear down, rebuild, and copy back. For me that convenience is worth the extra cost. its worth to mention that, for $5 per month you are getting only movie files on xbox (for now). Photos and Music files will not be working. Plex App will just not show you them. For me, having plex pass just to have videos managed from xbox is just not worth it - this thing can be easily done for free by any blu-ray player, Synology NAS, boxee, or any other free solution once you have hardware. 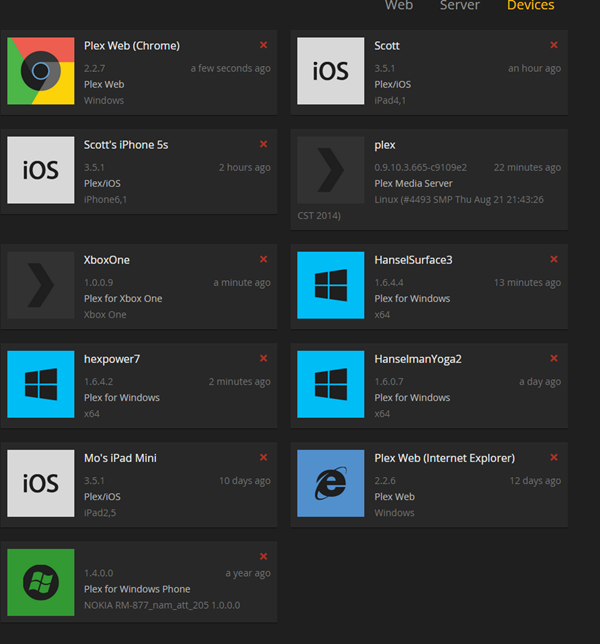 however its good to see movement in xbox area in this source of media servers. You should watch the original version of The Bridge. Subtitles are worth it. Freenas on a self built NAS running Plex and Plex Connect each in a jail. Plex Connect is a program that simulates a DNS server, it allows you to connect your apple tv3 with Plex using the trailers app. Is there a way to get similar funcationality to the HD Homerun by repurposing the tuner card I already have in my desktop ? I googled extensively last weekend and basically turned up empty handed. I would think some piece of software out there should be able to make my tuner card directly available on my network no ? Finally getting this to work with my Synology nas on one end and xb1 on the other. I can only get it to see my home video portion of my library for some reason. Do I need set the other parts of my library for sharing somehow? I have a Samsung Smart TV and it works amazingly with Plex. I didn't know about Plex before your post (Thanx for the education :) ). Samsung have a nice well performing Plex App with awesome UI very easy to use. Great stuff from Plex.